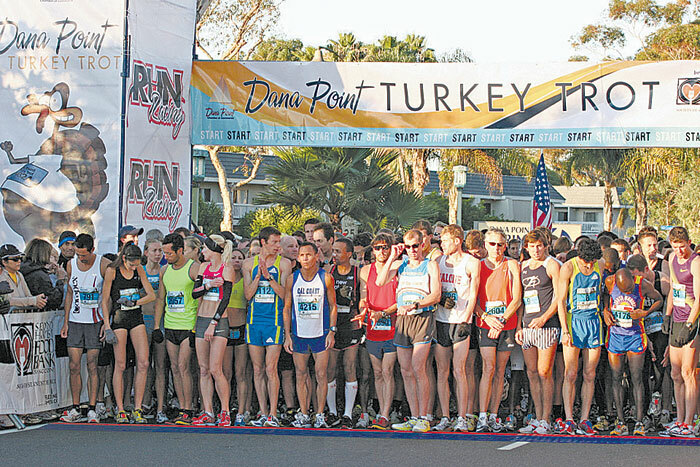 DANA POINT — Boaters can join an expected 10,000 runners, walkers and costumed celebrants at the 34th annual Turkey Trot, set for Thanksgiving Day — Nov. 22 — at Dana Point Harbor. While some of the runners will go around the course in wacky costumes to compete for prizes, hard-core sport enthusiasts will compete for speed awards in several divisions. In the 10K men’s and women’s categories, the first-place awards are $1,000, second-place awards are $500 and third-place awards are $250. Age division medals will be awarded for the top three men and women in each division in the 5K and 10K events. Funds raised at this year’s event will benefit the Dana Point Fifth Marine Regiment Support Group, helping local Marines and their families during the Thanksgiving holiday. The event’s costume contest judging will be at 9:10 a.m. at the starting line. The kids’ 1-mile Gobble Wobble Race, open to children 5-12, will start at 10:15 a.m. Runners can pick up race packets a day early — Nov. 21 — from 10 a.m.-5 p.m. in the parking lot at the southeast corner of Dana Point Harbor Drive and Golden Lantern. A free health and wellness expo is scheduled Nov. 21-22.